Auvergne has one of the most beautiful rural landscapes in France. At the center point of Massif Central, the region is prominent for its volcanic activity, which began about 20 million years ago. The Parc Naturel Regional des Volcans d’Auvergne and the Parc Naturel Regional du Livradois – Forez are the largest environmentally protected areas in France, and thus, the region’s natural scenery is relatively unspoiled. Auvergne can broadly be described as a mountainous and rugged countryside with rocky gorges and forested volcanic landscape. As a result, there are not many towns in Auvergne. The extinct volcanoes too provide for a strange and beautiful scenery. With its innumerable lakes, streams, geysers, gorges, and mineral springs, both hot and cold; the area attracts people seeking relief for various ailments including rheumatism, arthritis and other illnesses. The region was a central point of feudal fighting during the Middle Ages. The Le Puy-en-Velay was one of the starting points to the pilgrimage to the Shrine of Santiago de Compostela in Spain in 950. Via Podiensis is a very scenic route still sought by pilgrims from France and other parts of Europe, which has been recently included in the UNESCO World heritage sites. Auvergne was added to the royal territory in 1213 by King Philippe-Auguste. The region experienced immense suffering after the War of Religions of the 16th century and the epidemics and food shortages, in the subsequent century. Although peace and tranquility returned during the 18th century, resource shortages forced people to migrate to other regions of France. The 1858 rail link between Paris and Clermont Ferrand brought economic boom to the region. Clermont Ferrand, the largest town and capital, is at the center of the Auvergne region, which has several dormant (the volcanoes were referred to as extinct above, so I am not sure which is true) volcanoes and black lava stone buildings. The notable landmark of the city is the gothic Cathedrale Notre-Dame-de-l’Assomption with its black spires built from lava rocks, visible from any point in town. The Romanesque basilica Notre-Dame-du-Port is a UNESCO world heritage site, which is near the Rue du Port. The Puy–de-Dome is the highest dormant volcano in Clermont Ferrand and has recently been added to the ‘six grand sites of France’. There is a bus service going to the volcano during the summer and the site has a restaurant, as well as hiking and parasailing facilities. The cathedral town of Saint Flour is divided into an upper and a lower town parts. The upper town has the Cathedral of Saint-Pieve with a statue of Christ carved from black wood. The Museum of Haute Auvergne is housed in the Episcopal palace, while the Art and History Museum is housed in a building of the Renaissance period. Brioude, in the Southern part of Auvergne, has the 11th-14th century Roman style basilica Saint Julien. It is the largest church in Auvergne, especially notable for its frescoes and paved flooring. The beautiful Allier river provides many water sport activities. One of the longest rivers in France, the Allier flows through dense valleys, alonside numerous sleepy villages. The charm of the majestic river and its picturesque surroundings can best be experienced while canoeing or rafting. There is also a train running by the Allier Gorge, which offers one of the most spectacular riverside travels in France. The railway line itself is an engineering marvel, with its several tunnels, bridges and viaducts. 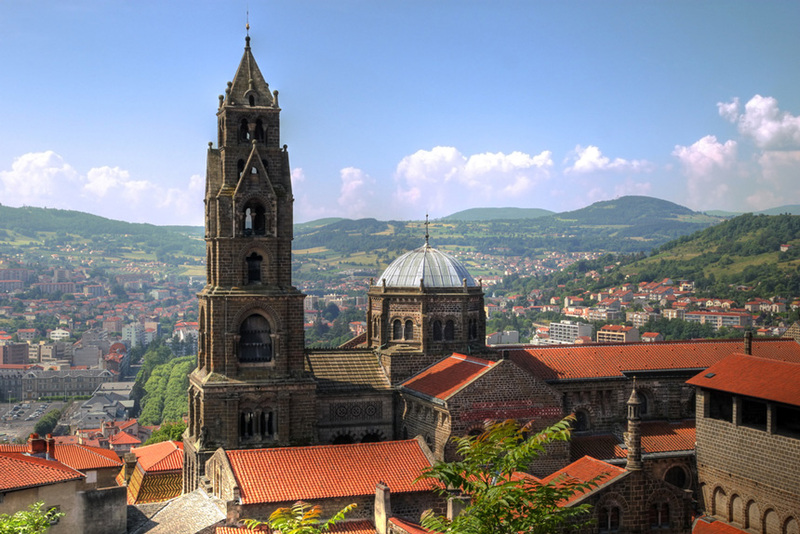 To the Northeast of Clermont Ferrand is Vichy, the second biggest town in Auvergne. Vichy played an important role during the Second World War as the government center under Marshal Petain. Apart from the Palace of Congress, Vichy is a notable spa town, particularly sought for the healing powers of the local water. The Castle France and the Covenant of the Celestins are among the noteworthy buildings here. The town of Moulins to the North of Vichy is a historical center worth visitng. Its Notre-Dame et Sacre-Coeur Cathedral is an outstanding example of 15th century architectural excellence with its stained glass windows, bell towers and the Christ in Majesty mosaic, which is among the largest in the world. Moulins is classified as an ‘art and history town’ of France.